When the steam engine was invented in 1781, some people believed that the world would soon see the end of manual labor. But the opposite happened. The steam engine created completely new sectors like railway systems or efficient factories, thereby eliminating some manual labor but also creating a number of new jobs, for example machine operators, engineers, or maintenance workers. Nearly 250 years later, the debate is still the same. Will the next generation industrial technology, namely the industrial Internet of Things (or Industrie 4.0 as it is called in Germany), replace our jobs? In their bestselling book “The Second Machine Age”, Erik Brynjolfsson and Adrew McAfee paint a very dark picture, suggesting that many white-collar jobs may be replaced by robots soon. Certainly, there is wide consensus that the Industrial Internet of Things (IIoT) or Industry 4.0 will lead to a replacement of simple and repetitive jobs in areas such as production assembly, administration, quality control, and planning. But will the overall number of jobs really decline? 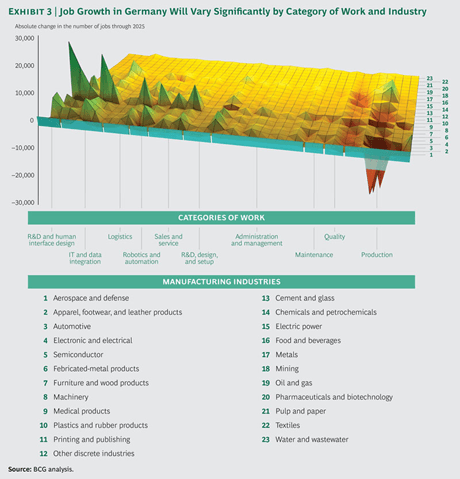 In a recent report that we published together with the Boston Consulting Group, we looked at 10 individual Industry 4.0 use cases and found that the overall picture doesn’t look so bad. “Germany for example would see a net increase of 350k (+5%) Industrial IoT jobs over the next 10 years”In fact, it looks very bright for certain job profiles – mainly those in IT and R&D. It currently seems that the new technology provided by IIoT will lead to new product offers and business models (such as machines-as-a-service, or on-the-spot 3D printing). If that trend continues, Germany for example, would see a net increase of 350k (+5%) Industrial IoT jobs over the next 10 years. The interesting part is that we will see a dramatic shift of job roles. The Harvard business review called data scientists the “sexiest job of the 21st century”. Currently, data scientists are a strongly growing job profile in consumer and e-commerce companies. Now they are also entering the world of industrial IoT jobs. The role of a data scientist is to extract and prepare data, conduct advanced analytics, and apply the findings to improve products or production. Industrial data scientists must understand both manufacturing processes and IT systems and possess strong root cause analysis skills to identify correlations and draw conclusions. Programming skills will be required, including capabilities to use both statistical programming languages, such as “R,” and general-purpose programming languages, such as Python. Individuals in this role will need the flexibility to address topics continuously or respond to specific requests, as well as be able to work onsite or remotely. Semi-autonomous, autonomous, and even humanoid robots are entering the shopfloors of factories. (See for example the Rethink Robotics Baxter line of collaborative robots). The role of robot coordinator will be a newly created industrial IoT job with the responsibility to oversee the robots on the shop floor and respond to malfunctions or error signals. The coordinator will carry out both routine and emergency maintenance tasks and involve other experts as needed. If a robot must be taken out of service, the coordinator will replace it with a substitute in order to reduce production downtime. In many cases, manufacturers will be able to retrain machine operators to take on this role, reducing the need for new hires. IT systems in manufacturing companies continue to become more complex and important. In order to manage the increasing amount of machines and products that are connected in real-time, IT solution architects take on the responsibility for the overall system design. They are involved in mapping the business needs to system requirements and technical requirements. Together with other technical architects they produce the technical specifications, integrating different technologies, platforms and people. The IT solution architect has end-to-end responsibility for applications such as remote operation centers, predictive maintenance, or assisted operations through augmented reality. As with the industrial data scientist, the IT solution architect possesses a broad range of skills, relating business know-how and IT experience with data management, application, and technology skills. The IT solution that is designed by the IT solution architect gets brought to life by the industrial computer engineer. Three kind of programming skills are necessary for these kind of industrial IoT jobs. Firstly, the programmer should be experienced in some of the major general purpose languages such as Java, C++, or Python. Secondly, he/she should be able to work with specific applications: e.g., Matlab and Simulink for industrial simulations or R for general data analytics programming. Finally, there is an important hardware component in the industrial programming environment. Robots and intelligent devices need to be programmed. Today, it requires a combination of languages such as C, VHDL, and proprietary languages such as Kuka’s KRL. Computer engineers also need to be aware that the increasing shift to cloud architectures brings in new programming paradigms such as components as services, an increasing focus on lightweight objects and layered services, as well as new protocols and lightweight programming languages such as node.js. Another job family that is slowly migrating from the consumer world to the industrial world are user interface (UI) and user experience (UX) designers. From intuitive manufacturing dashboards on tablets and mobile phones, to machine interfaces and robot interaction, augmented reality applications in operations and maintenance and finally the service and product design for the users of industrial equipment – the industrial environment will see a dramatic increase of user interfaces that need to be optimized for usability. The broad responsibility of a UX designer is to ensure that the product logically flows from one step to the next. UI designers on the other hand are in charge of designing each screen or page with which a user interacts and ensuring that the UI visually communicates the path that a UX designer has laid out. Both job functions are increasingly becoming more important in the industrial environment. Basic knowledge of industrial software architecture design and state-of-the-art programming paradigms are a must for any industrial UI/UX designer. The industrial internet is bringing the “internet mindset” to the manufacturing sectorAll of the top 5 Industrial IoT jobs are IT-related and some have already found wider adoption in various consumer-facing industries (such as the UI/UX designer). The industrial internet is now bringing this “internet mindset” to the manufacturing sector. In addition to the drastic increase of the above-mentioned IIoT job profiles, most other jobs that had previously few or no elements of “IT” will see increasing elements of IT integration as well. A machine operator’s job that had previously a lot to do with pushing buttons and pulling levers will see increasing elements of operating interactive touch-screens and training machines through digital interfaces. If you are deciding on your career path in the industrial or manufacturing sector, you should consider a career in one of these top 5 industrial IoT jobs. If you are past that stage and are looking to strengthen your profile you might want to retrain in any of the above areas (for example through one of the many online courses offered nowadays). If you are an executive in an industrial company, you should develop strategies to retrain your workforce or acquire these skills externally. We will not only witness a shift from classical engineering to IT-related work; It is also important to note that the new jobs created will require significantly higher qualification levels than the existing jobs on the shopfloor today. The often cited “war for talent” will be related to exactly these 5 industrial IoT job profiles described above – we will most likely see a shortage of qualified people, leading to very high wages in these areas. For additional information on the future of the industrial workforce, you can download the full report “Man and machine in Industry 4.0” here . Great work Knud. Excellent blog – really boils down a lot of the confusion I’ve been seeing in the field. I’m really impressed with your consolidation work on market size and revenue projections. I would love to see more of this kind of work – it’s makes it easier to create pitches to upper management when you have a “consensus” you can speak of. A good one, I was looking for a career in IIOT. But already having 10 years of experience in Industrial automation & instrumentation design, still confused which one if the above said jobs is suitable for me. All these new programming languages are one and the same – they all promise faster, smart programming, with fewer bugs.Many thanks for sharing this article.